Nearly three-quarters of Welsh voters think only EU citizens with the right skills should live and work in a post-Brexit UK, a BBC Wales poll suggests. Over half - 57% - of those questioned felt MPs should support the referendum result, while 24% said they should take account of their constituents' view on Brexit and 17% their own conscience. On the economic impact, 44% thought it would be negative and 33% positive. Meanwhile a majority of 60% said Donald Trump's state visit should go ahead. Only 38% wanted the UK government to withdraw the invitation to the new US president. 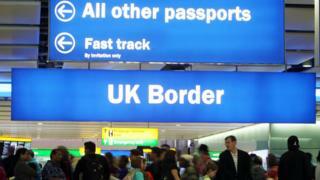 On the freedom of movement to live and work in the UK post-Brexit, the poll showed 74% agreed that only those EU citizens with the "right" skills or qualifications should be allowed in, with 19% believing that nothing should change and just 6% wanting the door firmly shut to EU immigrants. When questioned about the impact of Brexit on the Welsh economy, 44% thought it would have a negative impact with 33% saying it would be positive. When it came to personal finances, 17% thought Brexit would be positive, 30% negative and 45% thought it would make no difference at all. Martin Boon of ICM Unlimited, which carried out this year's St David's Day poll for BBC Wales, said: "With the triggering of Article 50 likely to be no more than a month or so away, the decision to leave the EU still has the power to somewhat mystify. "Wales voted marginally to leave, and this BBC Cymru Wales data confirms that the public probably did so despite knowing that it would harm the Welsh economy and their own personal finances." He added: "What's been described as 'project fear' may not have been convincing in comparison to immigration and control arguments, but that doesn't mean it failed to get through: 44% think the Welsh economy will be negatively impacted and 30% think their own finances will suffer - both being higher than those who think that positive outcomes will accrue. "Despite this acknowledgement, 'carry on' is the main message that people in Wales want Theresa May to hear." On devolution, the poll showed Welsh voters are keen for the Welsh Government to take more powers over day-to-day life in Wales but do not want an increase in the number of assembly members elected to Cardiff Bay. Only 27% of those questioned want to see an increase, with 43% saying the current total of 60 AMs is sufficient - 26% believe fewer AMs are actually needed. Asked to choose their preferred option for the future of devolution, 44% said they wanted an assembly with greater powers - an increase of one percentage point on a year ago. This option has been the most popular in every BBC Wales poll since it was first asked in this format in 2010. The status quo is preferred by 29%, down one point from last year, with 3% wanting an assembly with fewer powers, and 13% wanting the assembly abolished. That figure has remained stable since the Scottish independence referendum in September 2014, having previously been as high as 23% in March 2014. However, only 6% back the idea of Welsh independence, unchanged from the polls in 2015 and 2016. Support has been under 10% since 2011. 60% know the Welsh NHS is run by the Welsh Government, with 32% thinking the UK government is in charge. In a 2014 BBC Wales poll only 48% identified the correct answer. On health, 64% of those questioned believe the Welsh Government should spend more on the NHS, with 32% believing current spending is about right. The Welsh Government currently spends just under 50% of its £16bn budget on the NHS. ICM Unlimited interviewed a representative sample of 1,002 adults aged 18+ by telephone between 17 and 21 February 2017. Interviews were conducted across Wales and the results have been weighted to the profile of all Welsh adults.